Keep track of all the money spent on Clients, Projects, Specific Tasks and more. Never forget to invoice and get paid for your work faster. 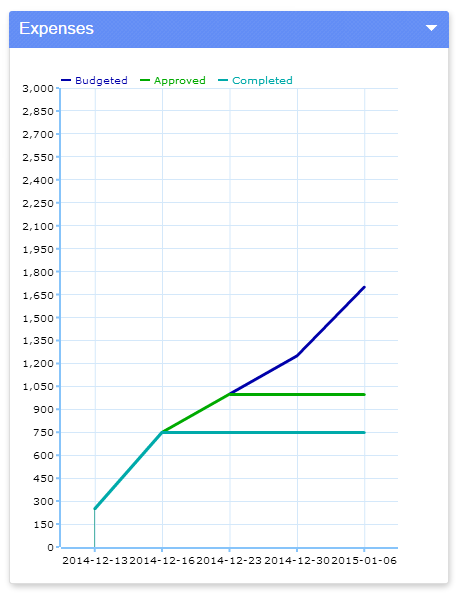 Improve your ability to estimate new project budgets accurately. Track profitability on projects or clients as easily as you track time and materials for your projects. Graphs for you to keep track of your expenses in a practical and quick view. Status selection to know if your expenses are approved, budgeted, pending, and more. The ability to add an unlimited number of payments to an expense, allowing you to set the number of installments you want. Filter by Date Range and Status, for a quicker access and clearer view of the relevant information. Make detailed and summarized payment reports that list the expenses grouped by clients and projects. Contact us to get your Expenses Module today! For more information on the Expenses module visit our Expenses module Manual or contact us!